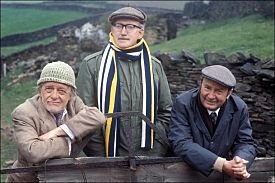 Many of you may remember the antics of these three older men as they scampered around the Yorkshire countryside. "Last of the Summer Wine" is one of my favourite TV shows and I have watched it over and over again. Everyday, Compo, Foggy and Cleggy would look for adventures, get up to boyish pranks and annoy the womenfolk. These guys had time to 'spare'. Our lives have become so busy that doing things important to our wellbeing, be they spiritual, mental or physical, can get pushed aside. John Lennon reflected that - "Life is what happens to you while you're busy making other plans." Our "Summer" is on the wane and 3 months of the year has passed. That is 3 months of my life ... as it is yours. Some resolutions have been started and continued, others have not! The colder months make changes more difficult to implement, so now is "a good time to make time". Come and join us for some of the activities on offer! This is a welcome return to a very good 10km course, which is ideal for Nordic Walkers. Participating in 10km distances gives a Boost your fitness & speed. There is some beautiful scenery along the way and this event is renowned for its spot prizes! Winter's coming so make the most of the warmer weather. Give yourself a challenge - you will be amazed at how far you can go on when Nordic Walking! Shape, tone, stretch and strengthen. Come inside the gym for a fully supervised class, designed to enhance your Nordic Walking movements, improve posture, strengthen core and stretch tight muscles. Learn how to correctly do gym exercises and understand how "less is more". This class will be offered 1 x month (depending on demand). Feature Walk - "Opium, Opportunities & Opulence"
This historical Nordic Walk of the CBD will incorporate facets of the City's past that included Opium dens, the Opulent buildings of the 1980's and the missed Opportunties for wonderful plazas and housing. This will be a fascinating insight into what was, is or could have been, Auckland City. In 2010, I had the priviledge to meet Rory. In remission after suffering 2 brain tumours, he had endured countless cancer treatments, leaving him weak and unsteady. 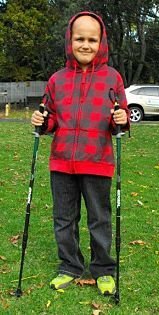 Through the tireless efforts of his parents, Rory was afforded every opportunity to participate in recovery options, which included Nordic Walking. In this photo, taken late on a cool Autumn afternoon, Rory had spent the entire day at the hospital, undergoing tests. Despite his obvious tiredness, he listened to my instructions and started to jerkily walk around the park. Watching him walk with and without the poles, I could see immediately how much the poles benefited his movement. He felt it too and his beautiful smile expressed all of the things he wasn't quite able to say. We continued to meet for further sessions, which included teaching Mum and Dad to Nordic Walk. Each time Rory was stronger, more coordinated and not short of throwing some cheek around! Four years on, Rory is strong and healthy. March is the Child Cancer appeal month, so please drop a few coins into the "Beads of Courage" buckets.